You are currently browsing the tag archive for the ‘ATWQB’ tag. 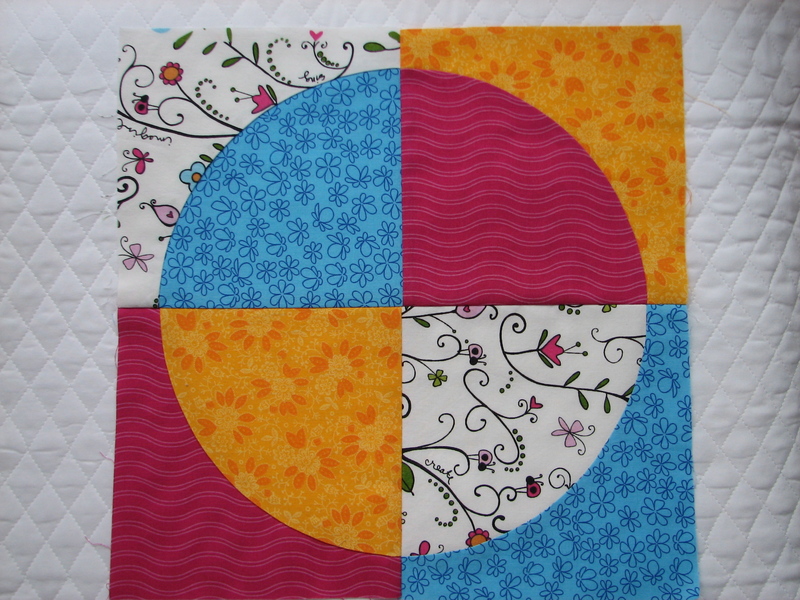 This is the last block I have to make for the original Around the World Quilting Bee. I made Jane a variation of a Hidden Star block called Barrel Jump. She loves pink and this said “Happy Summer” to me. It has one more stop before it heads home to her. I received my quilt back about three weeks ago.I have had a chance to flip through the blocks and admire the handy work, but not much else. I am looking forward to laying them out and deciding on a final layout. I am short a few blocks since a few ladies dropped out. I may make a couple to replace them or who knows. Sadly, I probably won’t get to finish it until September or early October. That is how personal projects seem to go for me. Some of these blocks have been in the works for quite some time. Everyone posted photos of their original blocks on the Flickr group page. From there, we have had some basis to start our musings on fabrics and patterns. 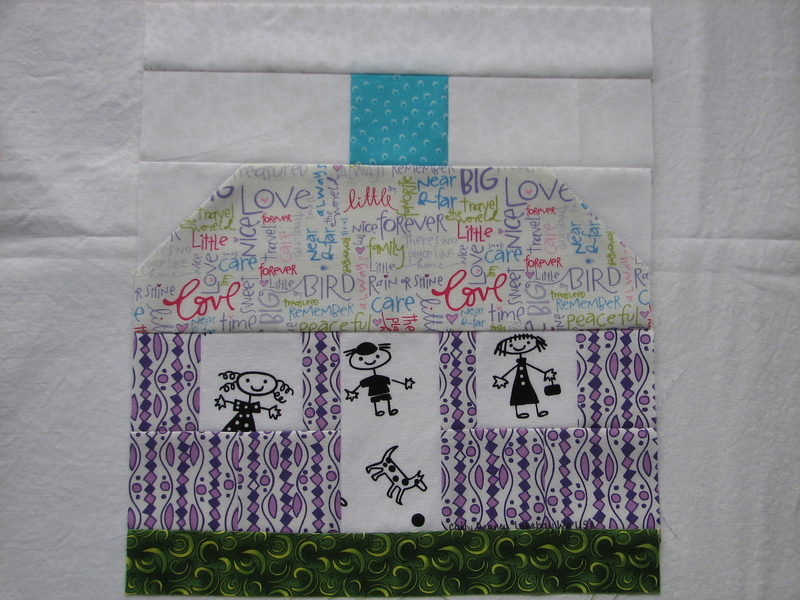 Caroll’s starter block had fun & whimsy written all over it from the get go. 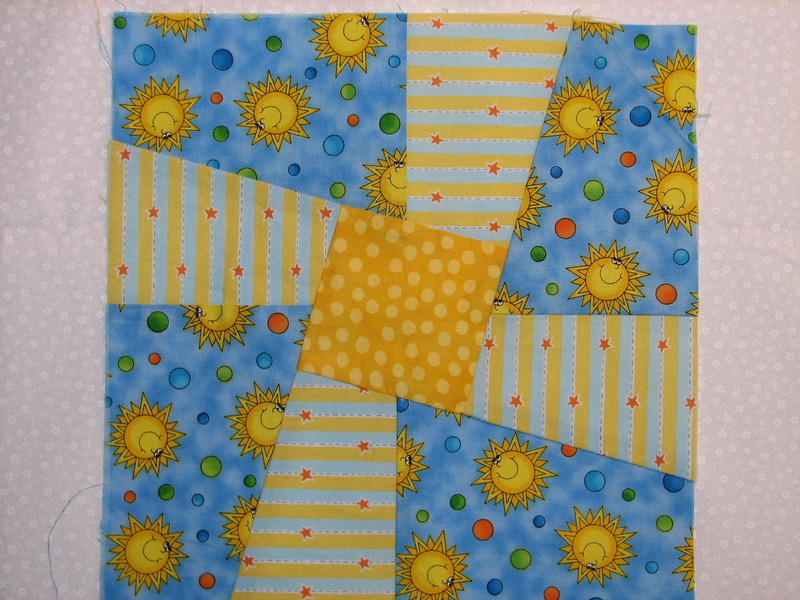 Who can be sad when looking at those cute sunshines in the Twisted Sister pinwheel pattern? Some of my travels this summer and fall took me to fabric & quilt shops way out of my normal home range. 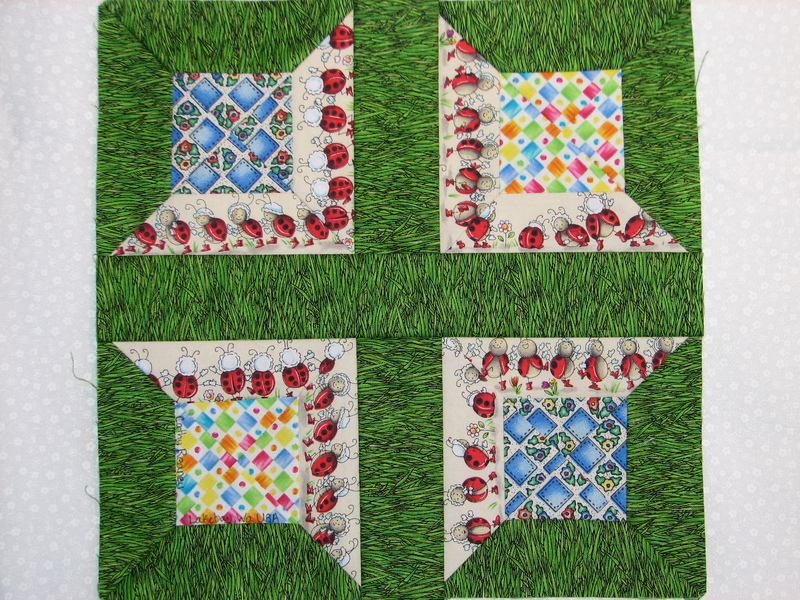 That is how I found the great grass fabric I used in the farm block and this adorable Ladybug print. When I saw the Ladies, I knew I had to work them into Caroll’s block. I bought enough to catch each one of the different lines of ladybugs on parade. 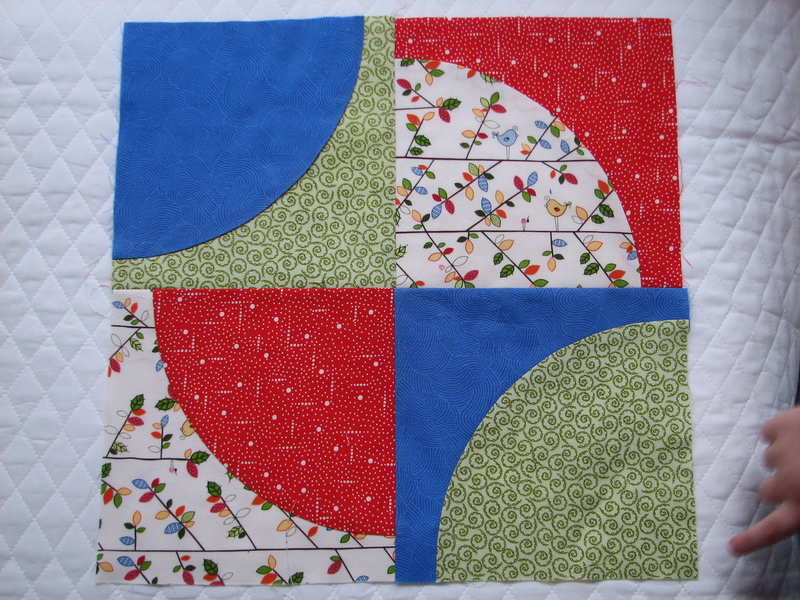 I have turned that into a block I am going to call Ladybug’s Picnic. It is a variation in the Square Dance block. 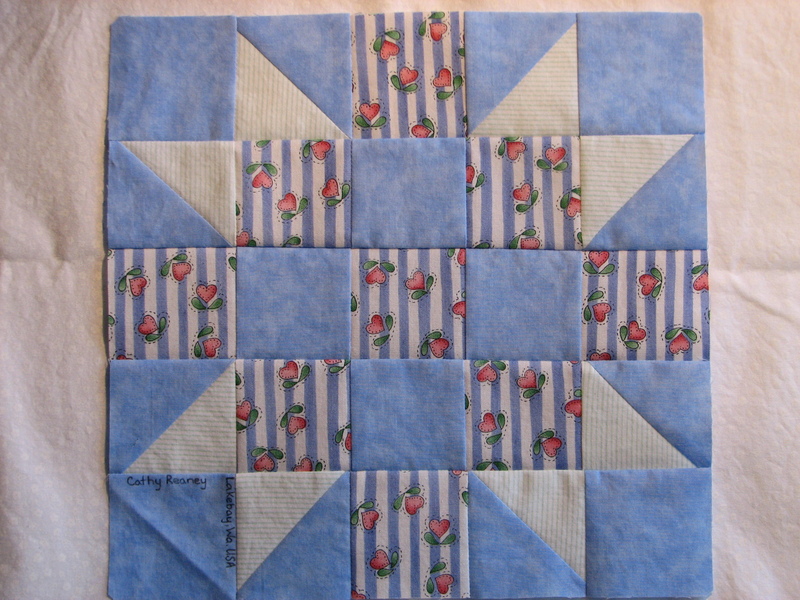 Her other block is made from one of my favorite pieces of fabric from the late 80’s or very early 90’s. I have every intention of making a Raggedy Anne dress with the rest, complete with the snowy white pinafore and bloomers. I have no idea why I like the blue stripes with the cutsie little heart flowers so much, but I do. I mixed it with a soft blue marble, and white with a mint green pinstripe. Soft and sweet. 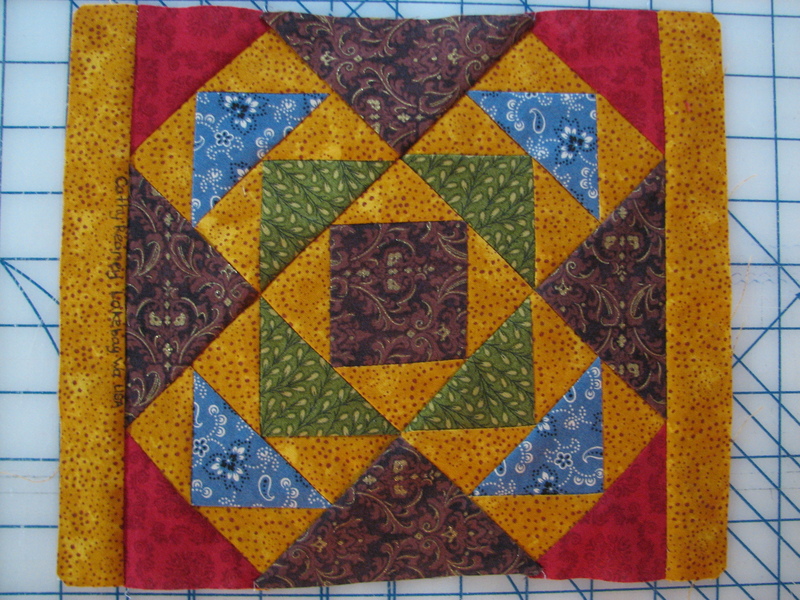 It is a variation of a variation on a Sister’s Choice block. Her quilt is going to be very cute when it is all finished. This is a bit of a jump backwards in the numbers, but the quilt just arrived way out of order. It still has a long way to go before it arrives back home to Katy in the UK, so I slipped it in before the other two I had here which are really close to being done. This block is similar to her starter block. She sent us a link to a tutorial for some cottages at Freda’s Hive. They are really cute, and really simple to make. The hardest part is choosing your fabrics. This block is the same size as the cottage blocks but is obviously a bit different. I thought she needed a farm in her little community. I started working on the design as soon as I saw her original block. I had some time without a steady stream of ATWQB blocks and would work on it then. The goats are representatives of the ones we raise here. The chicken weather vane is a nod to my husband’s small flock of hens. These will be off in the mail on Monday. 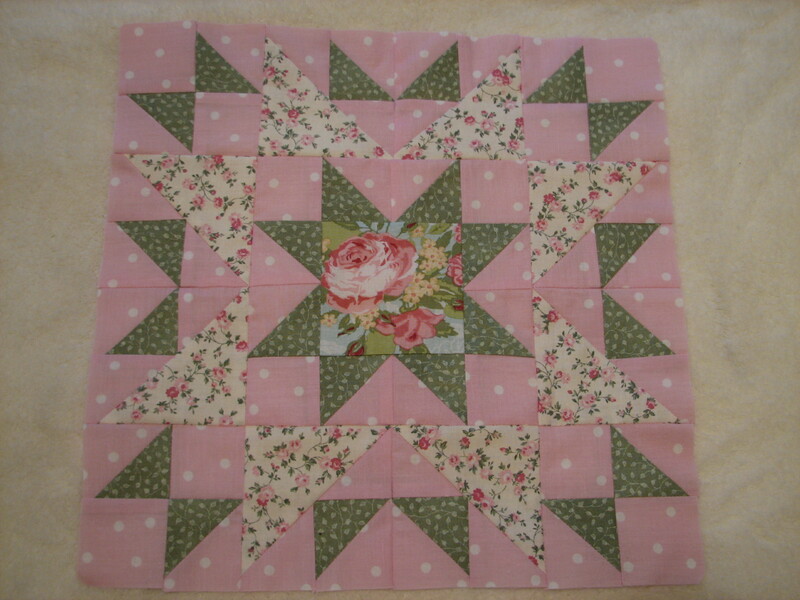 I have Caroll’s quilt out and am planning the fabrics for her blocks now. These blocks are for Paloma of Three Kitchen Fairies. She started off her quilt with some spools. When I saw them I began to search for the right fabrics for her block. I wanted to make wooden spools with a striped center piece to mimic thread. I found the “wood” fabric last summer in the Christmas clearance at Fabric.com. Finding the “thread” was harder. I wanted 4 pieces that went well together. I finally found 3 in the St.Jude’s Children’s Hospital collection. I was sure there had been a fourth, but could not find it. I have been looking since last August for another fabric that would work with this grouping. It was not going to happen. Then I thought that we all run out of thread eventually, so I put in an empty spool. I bought the safety pin print for another block that I haven’t gotten yet. 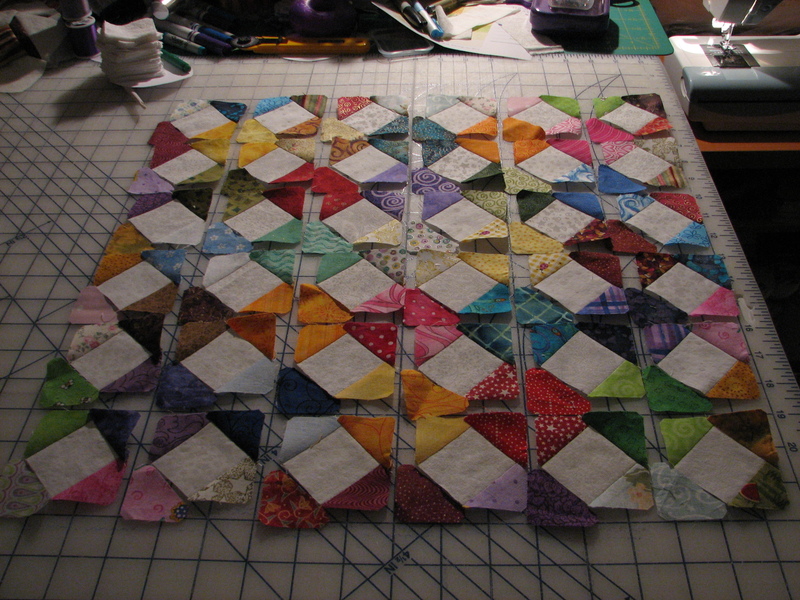 I think it was very fitting for the border that needed to go on this block to make it the final size. 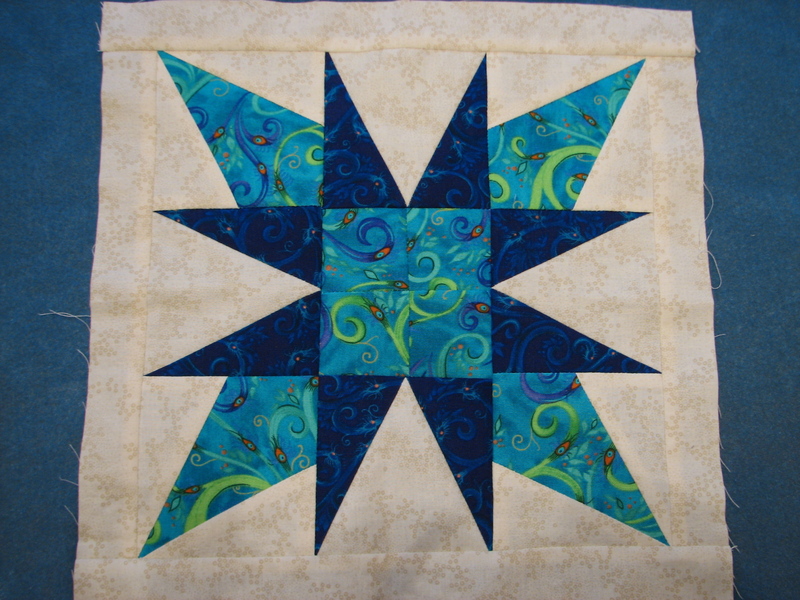 Her second block was inspired by the other stars and pinwheels that are in her quilt. When I read the size on the block pattern they indicated that it was a 6 inch block. My problem was that they only showed a quarter of the block for assembly purposes. I was a bit tired and extrapolated that when I put all 4 pieces together it would give me a 12 inch block. No. The complete block was 6 inches. So, I made 3 more and this is the end product. All of the swirls in the prints remind me of a pinwheel in a March wind. I hope she likes it. 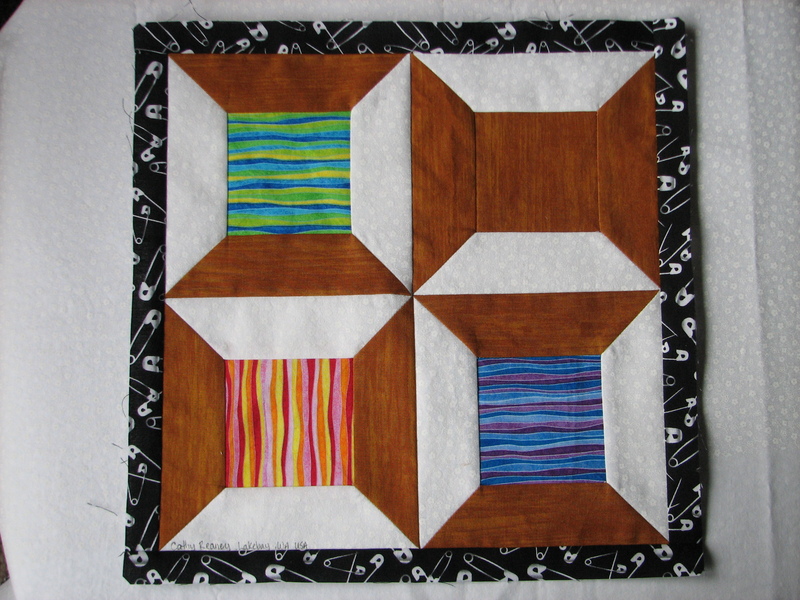 I have finished blocks for two more of the Around the World Quilting Bee quilts. That leaves me with two more here and two more on their way. Issac’s Momma (Sudi-Laura to the rest of the world) said that she wanted us to find something in our stash to use to make her blocks. OK! I have plenty of fabric to get through around here. I bought the ironwork pattern fabric for another block, but it didn’t work. So I went through the fat quarters & found some fabrics that went nicely with the colors in the scrolls. I thought the Churn Dash pattern would be perfect to showcase both the background and the feature fabrics. She was also short one block from her set. I found the Square in a Square mini-block and decided that I would go through my ends and make a sampler of some of my fabrics. These are all fabrics that I have used in the last few years for projects. Quite a few of them are to be found in the other ATWQB blocks. I did leave out the denim, corduroy, and fleece since they don’t iron out so well. The idea was great, but the execution about drove me insane! Scrappy is fun, but scrappy with a plan can be crazy. 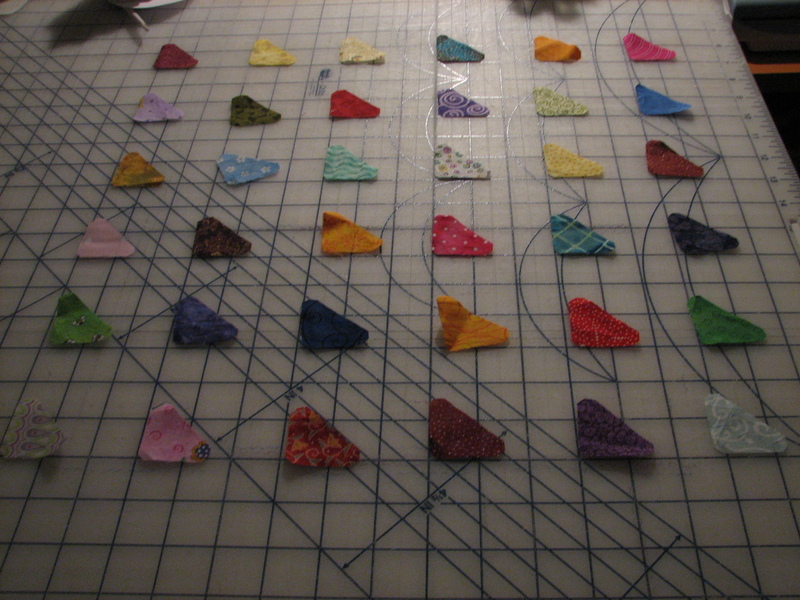 Next time, I will sew all of the triangles together into sets, THEN attach them to the white squares. I also think I need better lighting in here. It’s not so bad when I am at the machine, but sewing at night can get pretty dark, and don’t even try matching up colors then! Next was Cindra’s block. 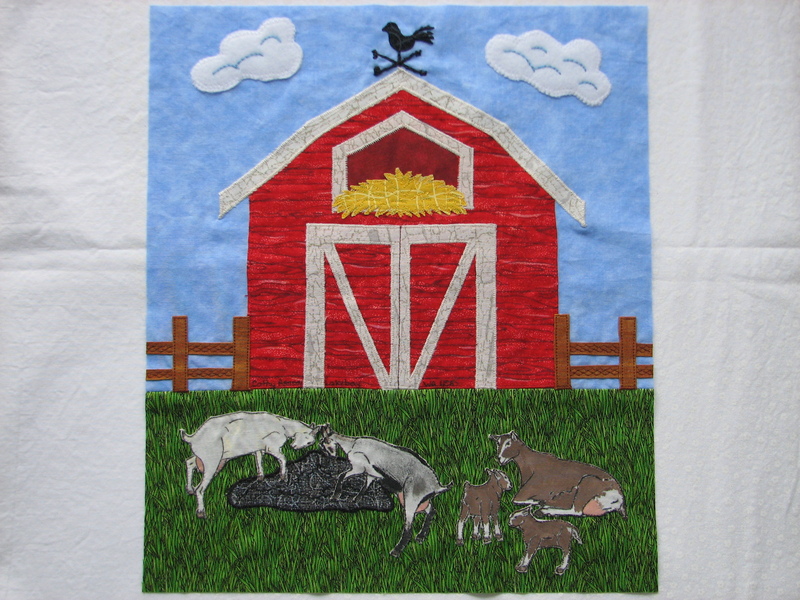 Her quilt was vibrant, and in some cases wild! (Penguins!) I wanted to find some of my snappier fabrics to make her block with. I found the ladybugs and remembered that I had the fun black and white floral print with the green centers. 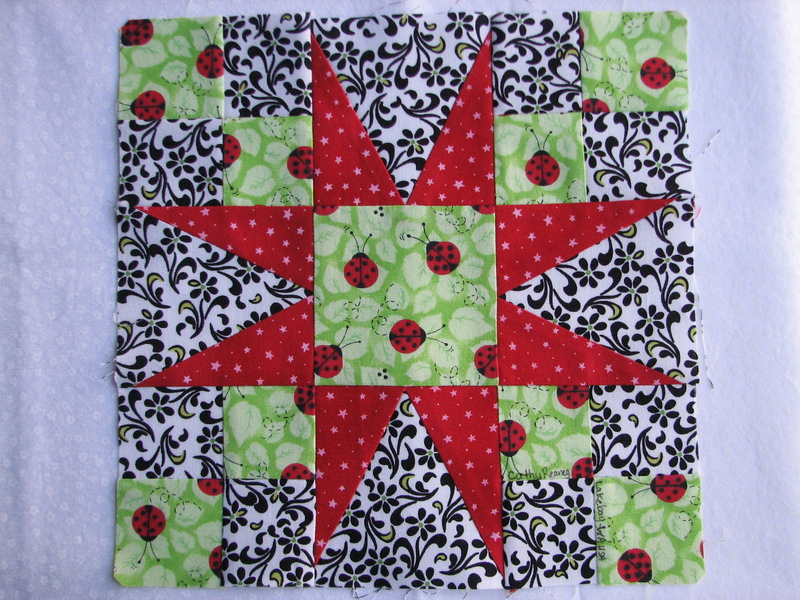 It took me longer to match up a good red with the ladybugs than it did to sew the block. I like the star with the stair-stepping blocks. 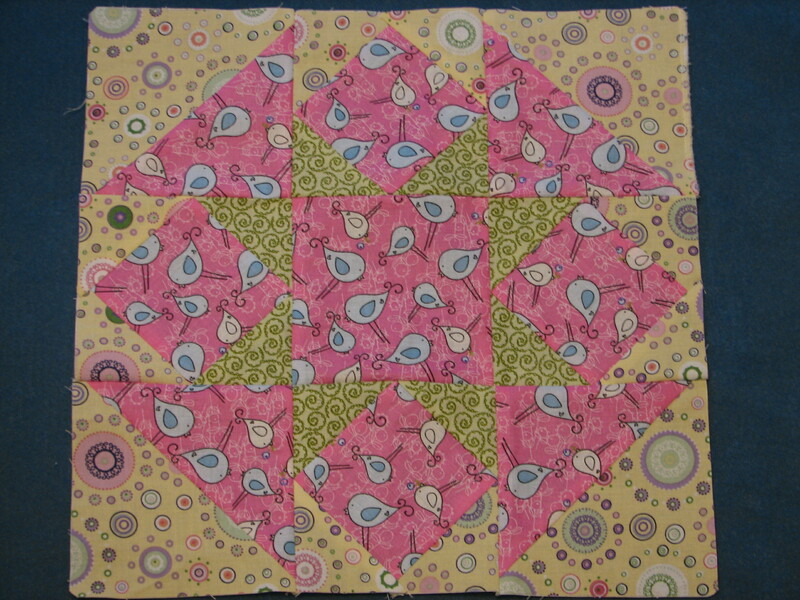 Quite a few of the other blocks in her quilt were also built on the 9-patch pattern, so this one should be right at home. I think she may be the last one to have all of her blocks made by different people. I have a few other sewing projects to finish off. (Yes, cousins, that includes hemming your lounge pants!) Then it is back the last few blocks I have. It seems like there should be more, until I realize that we started this back in May sometime! I guess time does fly when you are having fun! Aimee asked that we give the Drunkard’s Path pattern a try for her quilt. She even gave us a link to the site at The Sometimes Crafter on how to achieve the look she was after. 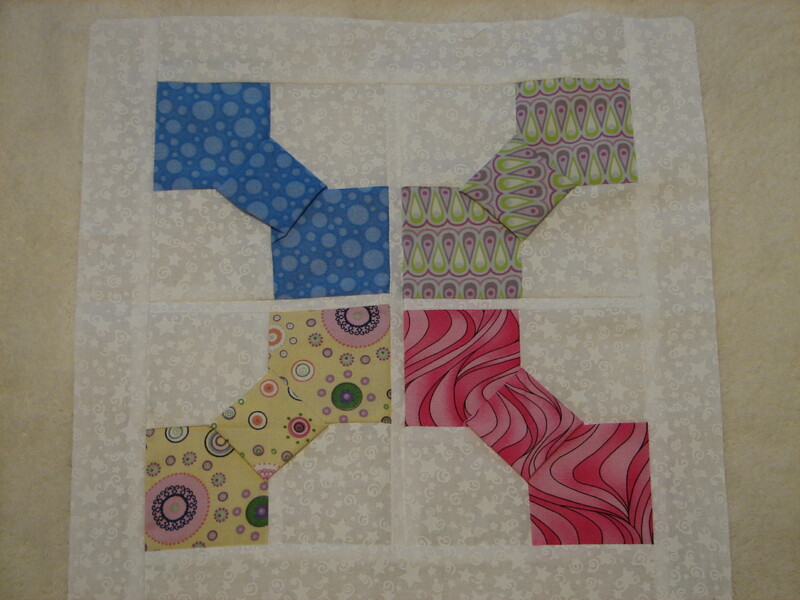 Again, I made two blocks for this quilt. This one was my first choice. I really liked the primary colors in the bird print and I had some great fabrics to go with it. Aimee’s starter block had the curved pieces set back into a circle. I do suppose that if she chooses, she can pull a few seams, rearrange the subsets, and make it a circle. This was my alternate colorway. The white fabric also has little birds and lady bugs on it. Picked up these prints because they were cute, but I had no set plans for them. Apparently Aimee’s quilt needed some birdies! I did set this one into a circle. The curved seams were not as bad as I had imagined they would be. I think starting on that large of a curve was helpful too. Pins, Pins, Pins were certainly the answer to keeping the fabric where you wanted it to be while sewing. The other thing to remember was to alternate the lay of the seam if it was being set into a circle. This kept the edges nicely matched up. Now to sign & send them, and on to block #19! The last two weeks have been crazy. I did manage to get two more quilts done. Lady Belle was to get a shadow box with two hummingbirds and two butterflies. Well…. The hummers turned out a little taller than they were supposed to. The book says all of the blocks should be 4″ square. I must have messed up the seam allowances somewhere. They were closer to 5″ tall and 4″ wide. 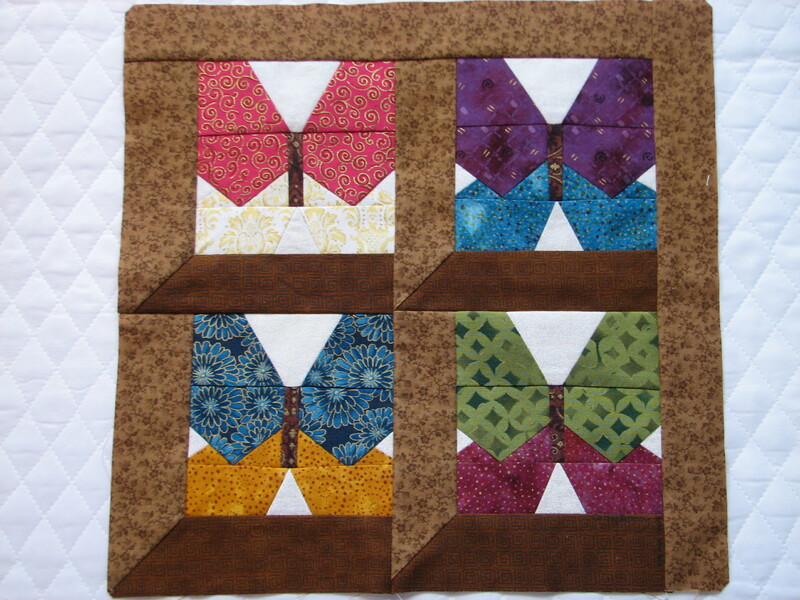 I made two more butterflies to go into the attic windows block. Y seams weren’t as bad as I thought, but I don’t want to make a career out of them! 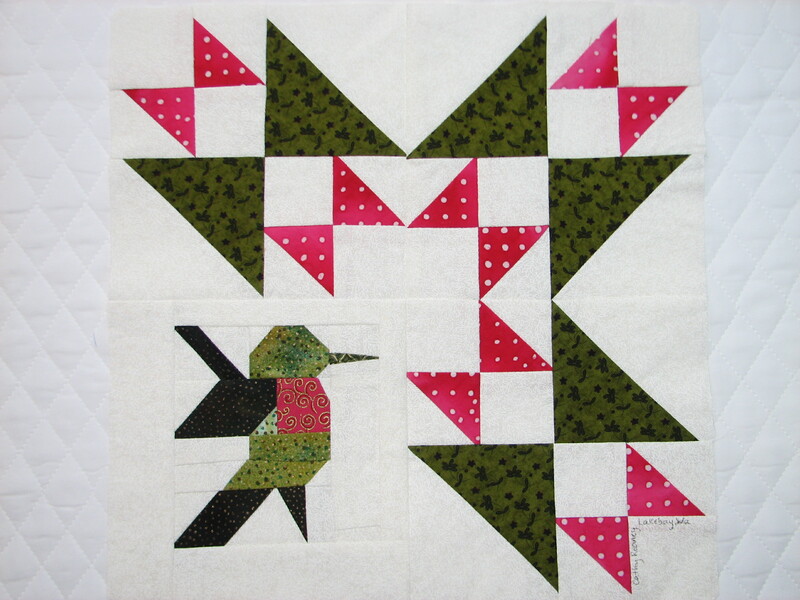 In the mean time I had flipped the hummingbird block on top of another book of more traditional patterns. When he landed, he covered up a part of the star block, and looked like he had stopped at a flower for a sip. Our local hummingbirds like the fuchsia baskets, so I modified a star pattern to resemble one. 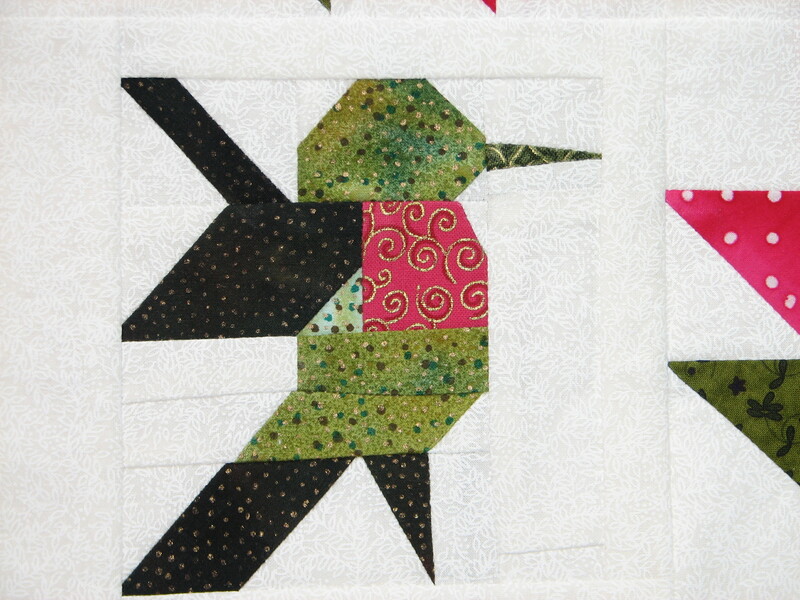 It is a good thing that I made two of the hummingbirds, because I doubt that I will make another any time really soon. There are a lot of tiny pieces. My guess is that it would be a good pattern for paper piecing. I don’t have any experience with paper piecing, so I don’t know how to go about adapting a pattern. I will eventually do something with the other one, like frame it or something! The butterflies also had some small pieces, but there were fewer of them. It was fun to mix and match the fabrics for them. The attic windows blocks reminded me of a shadow box, and the butterfly specimens you see at a museum. They turned out pretty good. I was going to add the antennae on to their heads, but then thought of how hard that would be to quilt around. I will let the quilt owner add her own antennae. I know that this is actually two blocks for the same quilt. We have had a couple of people drop out of the swap so this will help fill in some of the missing blocks. I can not promise that I will make two blocks for everybody that is short, but since it will help me get rid of some of my fabric stash I will make the effort. Things that happen on “Girls’ Weekend” …. Well, most of them stay in “Girls’ Weekend”. This year we traveled to Ocean Shores for a three day get-a-way. We had a nice time, ate good food, and we all brought projects to work on. I am the only one that can’t knit or crochet, so I brought along the newly oiled sewing machine and a few projects. Sorry about the photos. It was dark and rainy outside, so I had to use indoor lighting and it didn’t make for very good pictures of the blocks. 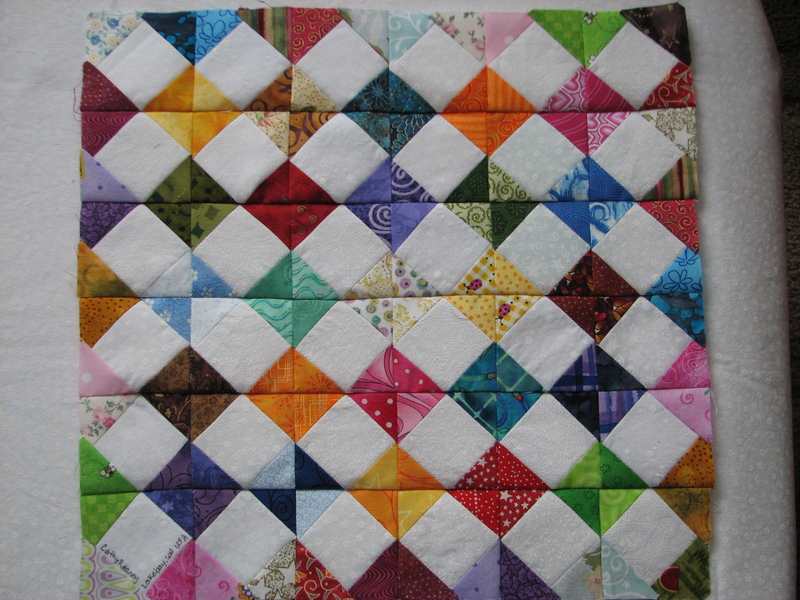 This ATWQB block is for Anita in the Netherlands. Her poor quilt was the first to try to make all of the ocean crossings from The Netherlands to Australia to Brazil and then to Florida, USA. We learned a lot about the shipping times with her bundle. It is just over half way through it’s journey and has a few more international trips to make before reaching home. It is looking fabulous, and I hope she will be happy. The next one is for Flossy Blossy. I think she is in Leeds, UK. 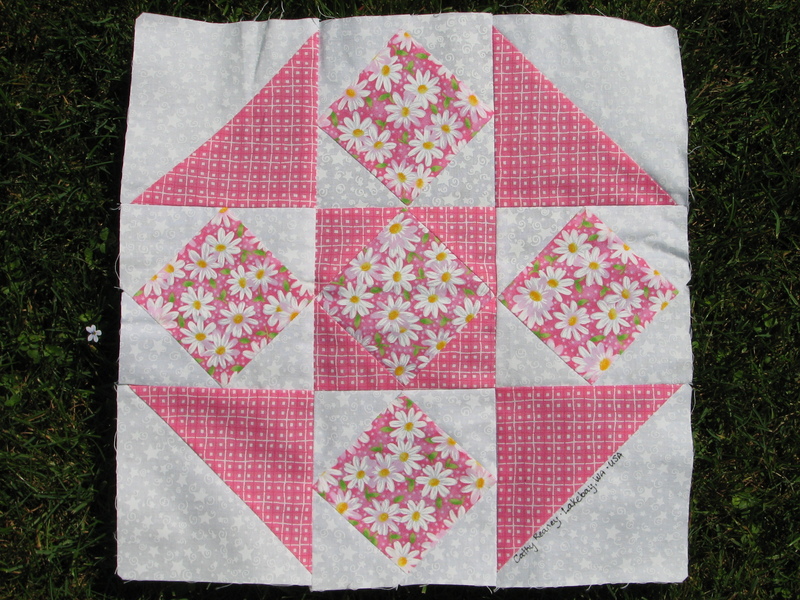 Her quilt is perky and cheerful too. She has made some fun blocks for the rest of us. I thought I would give her some dimensional bow-ties for her quilt. All I could think of while I was making these was; “What kind of guy would wear these as actual ties?” I am sure that somewhere out there, there is a librarian, musician, or somebody who would. I think they turned out cute, and I have some plans for another quilt using this pattern. Andrea of IndigoBlue is the recipient of this little gem. Sadly, I made it too big. When I measured her original block I was in a hurry and forgot a few things. My cutting table mat does NOT measure accurately from the very edge. So, when I measure I move everything in one inch. If the block says 12″ it really means 11″. I forgot this in my haste to get the block pieces pre-cut for the trip. I did not want to bring the parent quilts with me, lest something happen to them in transit, which would have reminded me to measure them again on my snazzy new rotating cutting mat my sister got me for Christmas. (Thanks again Sis!) Andrea will loose some points into the seam allowance, but that is not the end of the world. This is Kate N.’s block. She has some very pretty batik fabrics in her quilt. I did not have any that would do her quilt justice, so I found my peacock inspired fabric and created this. It blends well with the pretty blues and vibrant greens already established in the other blocks. I also made a lot of progress on Nicole’s project. I am making her a quilt with the Storm at Sea pattern. One of the girls tried to figure out how many individual pieces I had in the quilt. I told her to stop, as it was making me think about how much work this is. If I can think of it as fun, then it makes me happy to do it. When I realize how much work goes in to it, I think “Why didn’t I just get a gift card, and be done with it?” I am just not that way I guess. Besides, a handmade quilt, blankie, or afghan is like a hug that you can take with you. The person that made it for you has put a little piece of themselves into your gift, and thought about you while they made it. So, if you get a handmade gift, think of those things when when you thank the maker. Now that the weekend is over, it is back to my regularly scheduled life. WhooHoo! 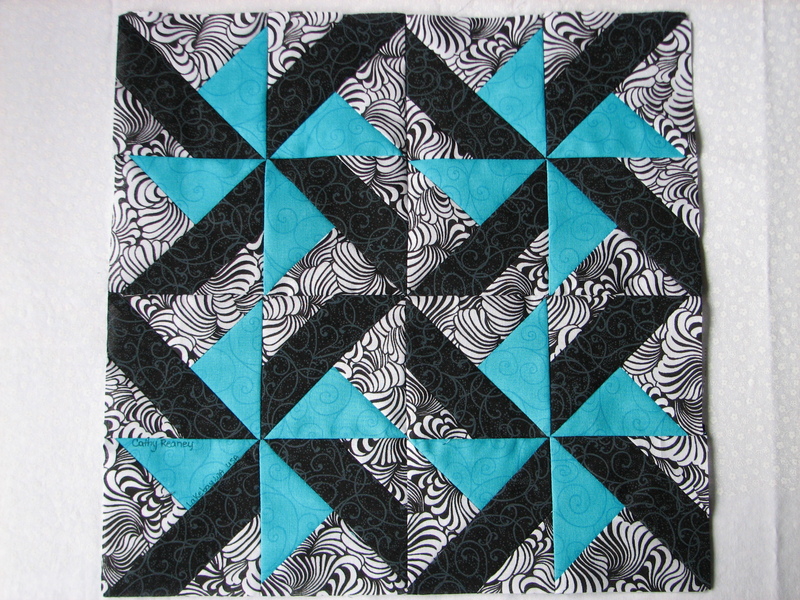 This is block # 17 on my list of blocks for the Around the World Quilting Bee. Kendall’s fabric choices are very Autumn and Fall friendly. I had fun picking some for her block. The chocolate paisley was just yummy. I liked how it had some gold ink printed over parts of the design. Apparently I have a fondness for the slight sparkle that it adds. I see that I have had some of it in most of blocks lately. This is not the glitter stuff, just plain gold metallic ink. I chose a variation on the Toad in a Puddle block called Rambler. 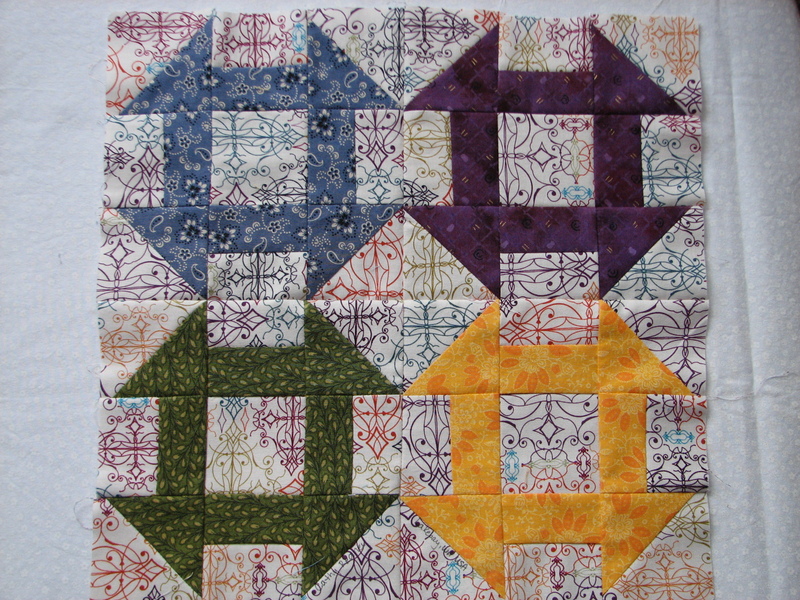 It was a first time for me making the flying geese elements of this block. They can be a bit tricky to piece and then match up with other segments. All in all this was a fun block to create. I just finished up my ATWQB block for Summer Sadie. Actually there are two of them. I am sure that is unfair somehow, but I couldn’t decide, so she will have to. This the first block. I had been picking up bits of fabric that I thought would go with her quilt and her personality. Then I actually got her quilt in my hands and decided that it might be a bit out of place. It makes a big difference to see the quilt in person, as sometimes the camera just doesn’t get the colors right. So, I went in search of some more vintage feel fabrics with the big cabbage roses on it. Apparently they are not as popular as I thought they were. I could only find them in this blue fabric, unless I wanted to sew it up in drapery fabric. So, I went with it, and found some complementary fabrics that created this. I only had to tear out a few seams because I sewed things in backwards. I think I have a system for the more complicated blocks now.We’ll see if that helps in the future construction. It is less important if things don’t need to be oriented in a certain way, but I tend to want my roses growing up, and things like that. I know, I am odd that way. In any case, this is what her quilt looks like now, and it will leave for its next stop in tomorrow’s mail. Wheeee! I am on to Kendall’s quilt block next. I hope to have some news on the others soon. After Kendall’s block, I will have made 12 of the 24 blocks. Apparently there are about 8 or 9 coming down the pike all at once. Yikes! I do have some plans for a couple of them, so that will help speed things along!